My first visit to the Mill Street Brew Pub was two springs ago to meet up with a friend who was even more unfamiliar with Toronto than I was at the time. It was back when the words Distillery District , organic beer, and Mill St. held little meaning or understanding. But as I ordered my glass of said organic beer sitting outside on a patio, both surveying the stonework setting and eyeing the impressive looking eggplant-parm sandwich being mowed down before me, I vowed to come back. Since then I have been back, but mainly because it's the only option if you want other than coffee shop or bistro-glam in the Distillery. The Mill Street Brew Pub is a corporate-styled gastro pub safe bet type: exposed brick, black swathed staff and sometimes kilts, a menu that's just a tad more upscale in price and offerings. It's tourist friendly pub food with lots of hand-held options for mid level professionals who like watching the food network and eating without cutlery. Of the sandwiches we tried, none were remarkable. The steak and gouda wrap ($9.99) at a bite tasted of juicy, smoked from the grill meat in a crisped shell, however, it was reported later to rapidly decline into soggy disarray. It also could have used more cheese. The lamb burger ($9.99) deemed dry, also disappointed with a skimpy more - for show than taste - topping of feta. The prime rib burger ($12.99) was judged as"surprisingly good". I found the pulled pork sandwich ($11.99) satisfactory. The pliant pork was deeply infused with a fragrant barbecue sauce singing of apricot and well matched with a soft, eggy onion roll, but again, the cheddar served atop was strangely imperceptible. The cheese in the appetizers fared much better. The stilton in the spinach, artichoke and stilton dip ($9.99) was completely over-powering; in a good way as I'm a huge fan of brazen blues. The decorative salt on the pretzel bread alongside was cute, but overkill. Creamy dollops of mild goat cheese in the strawberry spinach salad ($12.99) perfectly offset the dessert-quality candied almonds and ripe fruit. We also had the soy and ginger wings ($10.99/2lb) which I thought were just ok - a bit over cooked with sauce that wasn't quite lick your fingers good - even though everyone else seemed exclaimed otherwise. The steak and stilton pie ($11.99) was quite nice: buttery crumbly crust and not too stringy meat in a robust gravy with a depth of their coffee porter brew. It was sided with textbook mash and pleasantly sweet peas without a whit of mush. Although not on my list of wow-worthy hits, I'm sure I'll be there again, and many times more if only for a sunny seat outdoors and an icy pint of that Belgian Wit beer I'm currently obsessed with. 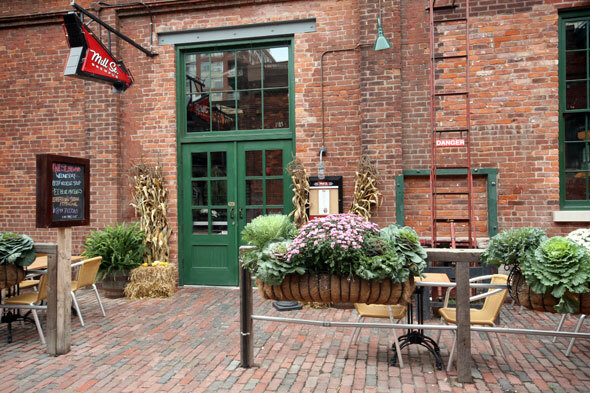 Join us for the grand opening of our patios at both Mill Street Brew Pub and Mill Street Beer Hall located in the historic Distillery District. We will be offering complimentary beer sampling, passed appitizers, and live music.